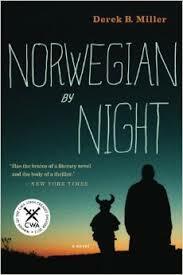 a book chick: "Norwegian by Night"
my take: Having recently been in Oslo, I was excited to read this detective story set there. I was surprised by the issues it made me think about: mainly immigration. A well-crafted mystery with very interesting characters... the slightly dementia-confused American war veteran and a young Slovac boy who witness a crime which leads to an epic journey to run from those who killed the boy's mother and to run to those who they think can help them.